The Home Care Software Geek posts in this blog don't talk about Home Care Nursing Software, Private Duty Telephony, DME Delivery Software, Home Infusion Care Management or the other topics we focus on regularly at Ankota. Instead, these posts are intended to keep our readers up to date with technology trends that might be useful to your agencies, such as social media technologies, mobile devices, and what's happening from the big-boys like Microsoft, Google and Apple. Most of my work day is spent on the Internet and the key applications that I use during the day are in "the cloud" (which is currently the popular term for software applications that are hosted out in the internet as opposed to on your local computer or inside your company). In addition to using the Ankota software in the cloud, I use other things like gmail, google calendar, Facebook and LinkedIn, and I do most of my shopping on the Internet at places like Amazon.com and others. 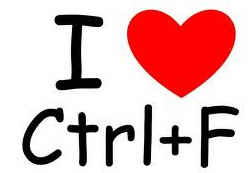 Search within a web page using Ctrl+F: Sometimes you're on a web page and you need to find something within the page. Like you searched for something in google and it took you to a page where it seems like you can find the answer. But once you get to that page, you still can't find what you're looking for. By pressing "Control F" (or "Command F" on the Mac) a search window will appear (usually in the upper right but sometimes in the upper left) where you can type what you need and find it on the page. Try it out. Duplicate the Tab: Sometimes I hear complaints about computer applications (on and off they web) that only let you do one thing at a time. For example, you're in the middle of doing billing and then a scheduling question comes in. You don't want to lose your place on the billing page, but you need to check the schedule for one of your caregivers on the phone. In many cases, you can "duplicate the tab" that your in. Your web browser will make an identicle copy of your session and open it in a new tab. Then you can deal with the scheduling issue in the new tab without losing your place in the other tab. Some applications might prevent you from doing this but it works in most cases. Note that the way to duplicate your tab varies by browser. 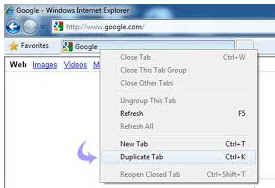 In windows, right click in your current tab and look for an option like "duplicate tab" or just "duplicate". For Mac people (who generally don't have a right mouse button, you might need to push the command button then click. If you have some tips for using computers that might help other nurses, therapists, and home care administrators, please respond with comments to this post. We'll see what feedback we get and will consider follow up posts.